You may have seen in headlines recently that Valentine's Day this year will have no Necco's colorful SweetHeart Candies, after the company filed for bankruptcy in 2018 and closed its doors. Not to worry though, Classical MPR has you covered! 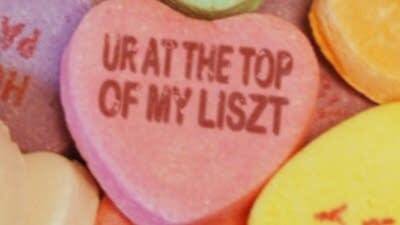 We've selected our top 10 cheesiest pickup lines for classical music lovers and put them on our own candy hearts for you. Choose your favorites and rate them up or down in our list. Image templates courtesy of Image Chef.